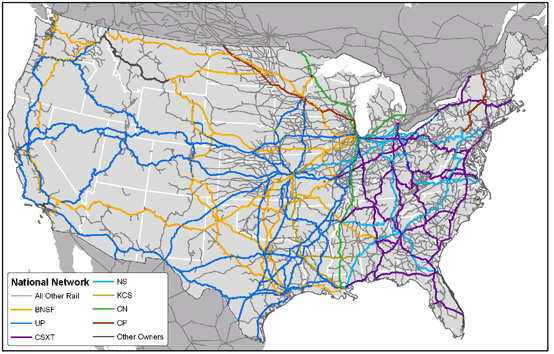 Above are four of the largest publicly traded pure-railroad companies in the United States-- Union Pacific (NYSE: UNP) in dark blue, CSX (NYSE: CSX) in purple, Norfolk Southern (NYSE: NSC) in light blue, and Kansas City Southern (NYSE: KSU) in gold. Yahoo U.S. railroad transportation/industry (stock index): (^YHOh877). Compare YHOh877 to Dow, S&P 500 and NASDAQ. "There hasn’t been a major railroad merger in North America since 1999. But yesterday Matt Rose, executive chairman at Burlington Northern Santa Fe, warned that North American railroads could face a wave of mergers if regulators approve CP’s efforts to take over Norfolk Southern. Jason Seidl, Transportation Analyst and Managing director at Cowen and Company, discusses possible targets and suitors." Video above: Proof that American railroads are robust investment opportunities. On Feb. 12, 2010, BNSF (former stock symbol BNI) merged with parent company Berkshire Hathaway Inc. (BRK-A). BNI Historical Stock Prices are here. EMD (Electro-Motive Diesel) locomotive: On June 1, 2010, Caterpillar Inc. announced it had agreed to buy Electro-Motive Diesel, Inc. from Greenbriar, Berkshire et al. for $820 million. Caterpillar's wholly owned subsidiary, Progress Rail Services Corporation, completed the transaction on August 2, 2010, making Electro-Motive Diesel, Inc. a wholly owned subsidiary of Progress Rail Services Corporation. Although Caterpillar announced that John S. Hamilton would continue in his roles of president and CEO of EMD after the close of the transaction, Mr. Hamilton left EMD for unspecified reasons in late August 2010. Railex (private): Uses Union Pacific and CSX along with special Railex-designed, purpose-built refrigerated cars to transport produce. Railex, a refrigerated rail transport and warehousing company, began service in 2006. Guarantees five days coast to coast. Routes: Washington (state) to New York; and Delano, CA to New York. A single train is equal to 220 semi trucks.